Turkey's President Recep Tayyip Erdogan, talks to members of the ruling Justice and Development party in Ankara, Turkey, June 13, 2017. Erdogan reiterated his country's position to support Qatar. Turkish President Recep Tayyip Erdogan has placed himself at the forefront of the defense of Qatar, in the face of Saudi Arabia-led economic and diplomatic sanctions. “A very grave mistake is being made in Qatar; isolating a nation in all areas is inhumane and against Islamic values,” Erdogan said in his weekly Tuesday address to his parliamentary deputies. “It's as if a death-penalty decision has been taken for Qatar,” said Erdogan. Erdogan is backing his increasingly tough rhetoric with action. A Turkish delegation flew Tuesday to Doha to prepare for the deployment of a military force in Qatar, which ultimately will rise to about 5,000 soldiers. Ankara already has sent large amounts food to break economic sanctions against Qatar. “The risks, however, are high. If there is an escalation into a confrontation or any kind of hot conflict, this would expose those soldiers to all kinds of threats,” warned retired Turkish ambassador Unal Cevikoz, who heads the Ankara Policy Forum research group. The Turkish army deployment is part of a military cooperation agreement with Qatar made before the crisis that also includes naval and air components. The army element of the deployment was brought forward by the onset of the crisis, with the Turkish parliament rushing through the required legislation to sanction it. Playing down risk of military confrontation, analyst Sinan Ulgen a visiting scholar of the Carnegie Institute, points out that only a handful of Turkish soldiers initially will be deployed. Turkey's Foreign Minister Mevlut Cavusoglu speaks during a news conference with German Foreign Minister Sigmar Gabriel in Ankara, Turkey, June 5, 2017. Erdogan's robust stance in support of Qatar, scotched his foreign minister Mevlut Cavusoglu's offer to mediate. Ankara's robust support for Qatar is a testament to the deepening relations between the countries. Qatar is fast becoming one of the most important investors in Turkey, buying up banks, media companies, and investing in property. Those investments accelerated in the aftermath of last year's failed coup in Turkey, which saw many foreign investors shying away. But the relationship extends far beyond economics, and a strong relationship has developed between the country's two leaders. According to reports not denied by either country, Qatar sent 150 of its special forces to protect Erdogan in the days after the July coup. Turkey's main opposition Republican People's Party leader Kemal Kilicdaroglu speaks to the media in Ankara, Turkey, April 16, 2017. Foreign policy collaboration, though, is where cooperation appears to be most important. “Turkey has aligned itself more closely on a number of foreign policy options, which would include support of the Muslim Brotherhood, support of Hamas,” pointed out analyst Ulgen. Ankara could pay a heavy price for its loyalty to Qatar, however, coming at a time when Turkey already is facing strained relations with most of it Western allies and all of its southern neighbors. Turkish pro government media has been sounding alarm bells, warning that the pressure facing Qatar really is a plot aimed at Ankara and Erdogan. 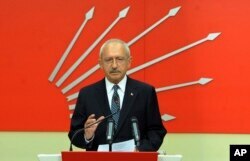 Kemal Kilicdaroglu, the leader of Turkey's main opposition Republican People's Party, voiced concerns about the precarious position facing Turkey over Ankara's support with Qatar for the Muslim Brotherhood. “Egypt, Saudi Arabia and the United Arab Emirates are all regarding the Muslim Brotherhood as a terrorist organization,” said Kilicdaroglu, criticizing Erdogan's public use of Muslim Brotherhood symbols. Erdogan has made little secret of his support for the Brotherhood, a stance that plays well with his religious base of voters. “Support of the brotherhood has become part of domestic politics,” pointed out Ulgen. But Ulgen emphasizes that the pressure facing Qatar cannot be applied to Turkey, although he warns the present crisis likely will put Ankara in an awkward position. President Donald Trump has been particularly outspoken in support of Saudi Arabia's stance in demanding that Qatar end its support of the Muslim Brotherhood, along with other radical Islamist groups, but he has remained publicly silent over Ankara's stance toward the brotherhood. According to Turkish media, Trump and Erdogan are scheduled to talk about Qatar in the coming days.